Who inspires and encourages you? 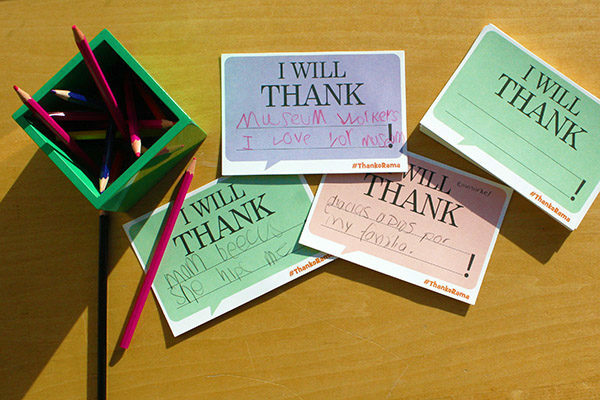 Share your unique thank you message on our giant frame wall on Tuesday, November 20 and Wednesday, November 21 from 9 to 3. Also, visit the whimsical world of Mo Willems at The Pigeon Comes to Topeka! A Mo Willems Exhibit at the Kansas Children’s Discovery Center, open through January 4, 2019. The exhibit brings to life all of Mo Willems’ most popular picture books and characters, including The Pigeon, Elephant and Piggie and Knuffle Bunny in a fun, interactive exhibit that’s full of laughs. The Pigeon Comes to Topeka! A Mo Willems Exhibit is included in regular admission to the Kansas Children’s Discovery Center, which is $7.75 for kids and adults, $6.75 for seniors, and free for infants under 12 months and KCDC members. Admission also lets you play all day at the Kansas Children’s Discovery Center with over 15,000 square feet of indoor exhibits exploring science, careers, art, building and more, plus a 4.5 acre certified Nature Explore Outdoor Classroom.